A top prize of $4 million went to the winner out of a $9 million total purse. Seeking the Soul came in second and won $1.25 million. Accelerate finished third and won $900,000. Earlier in the day, Bricks and Mortar outpaced Magic Wand to win the inaugural Pegasus Turf International. The purse for the turf race was $7 million, with $3 million going to the winner. 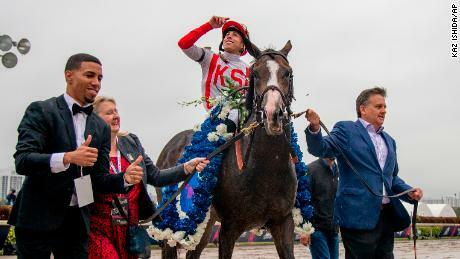 The Pegasus World Cup, organized by the Stronach Group, has been in existence for only two years but was crowned the world’s richest race in 2017. This year the competition was expanded, with the turf race added to the dirt track contest. CNN’s Ben Church contributed to this report.